Come and enjoy yourselves as a family on the Le Champ Neuf campsite. You can swim, relax and enjoy yourselves in our waterpark which contains water slides, a Jacuzzi, a waterfall and a pool for the little ones. Open from the month of April, this covered and heated waterpark gives you a tropical atmosphere with its heated water. The added advantage of our pool is that you use it right up to the end of October. The little ones can also enjoy themselves peacefully in their special pool area with its little slide and water jets. 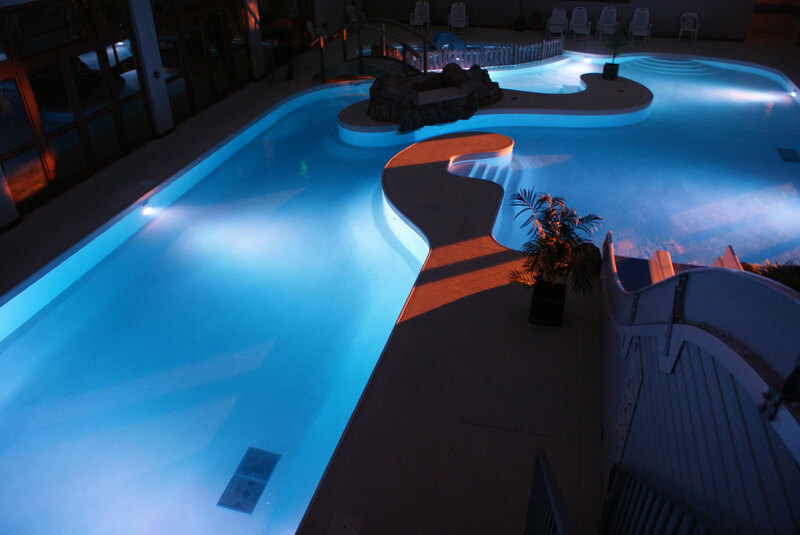 After a relaxing time in the pool under the waterfall or on the bench in theJacuzzi, or even after a few descents on the waterslides and chutes for the more adventurous, you can relax on the sunbeds inside the pool area or outside on the terrace. The depth of the pool is progressive from 0.7 metres to 1.4 metres. Children must be accompanied by their parents in the pool and kept under supervision at all times. Children are the sole responsibility of their parents. The wearing of a bracelet is compulsory for all. Anyone not wearing a bracelet will be refused entry into the pool. Swimming shorts are not permitted in the pool. Only swimming trunks/costumes are permitted. Certain rules must be followed such as passing through the showers and footbath before entering the pool. The wearing of shoes is not permitted inside the pool area and the consumption of food and drinks on the beach areas surrounding the pool is not allowed. We ask you also to follow the rules pertaining to the waterslides and chutes. Each week in July and August, we organise an evening party at the pool as well as activities in the pool. Give yourself a moment of relaxation and well-being in the sauna which is situated next to the pool. Entry is free of charge. For those who love sport, a little body toning is possible in the fitness room which also is free to use.